The 2018 Audi A8 can detect bumps in the road surface and adjust the active suspension accordingly. Audi has been slowly drip-feeding us information about the new 2018 A8 luxury sedan ahead of its reveal in Barcelona on July 11, though you’ll be able to see it before then on the big screen in the upcoming Marvel movie Spiderman Homecoming in some blatant product placement. After demonstrating the A8’s advanced autonomous technology which enables it to cruise through city streets and park itself without supervision, Audi is now showcasing how the A8 detect bumps in the road before you hit them and adjust the suspension accordingly. A front camera scans the road ahead and analyzes the surface condition 18 times per second to detect bumps in the road. Before you can hit them, information is sent to the active suspension which predicatively adjusts itself accordingly. The preview function developed by Audi transmits the right amount of travel to the actuators and actively controls the suspension for a smoother ride. The suspension reacts precisely at the right time, which Audi claims will eliminate any vibrations and jolts. Audi also claims that the A8's active suspension minimizes body roll when cornering and pitching movements during braking or accelerating. Each wheel has an electric motor powered by an 48-volt main electrical system to improve stability. 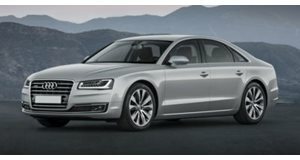 Four-wheel steering also makes the Audi A8 more agile while giving it a smaller turning circle than an A4 which is an impressive feat. The Audi A8’s active suspension offers safety benefits too, as installed sensors can reduce the risk of road accidents by preempting collisions. If the system detects that a side impact over 15 mph is imminent, the suspension actuators raise the body on the exposed side by up to 80 millimeters within half a second. By doing this, Audi says the force of the impact will be directed to stronger areas of the luxury sedan such as the side sills and floor structure, reducing the load on the occupants by up to 50 percent, thus minimizing the risk of injuries.